by Nidhi Aggarwal, Chirag Anand, Shefali Malhotra, and Bhargavi Zaveri. Orders that match with each other with no resultant change in the ownership are termed as self-trades. Lately, there have been increased concerns regarding self-trades in equity markets in India. With no genuine trading intent, these trades are seen as manipulative in nature, aimed at artificially pumping up the turnover to portray a false picture of liquidity. Self-trades are prohibited under the present law, and SEBI has punished several firms on this score. In this article, we argue that there are some kinds of self-trades which do not constitute market abuse. With no manipulative or fraudulent intent, a trading firm can hit its own bid or offer. Penalising firms in such situations is wrong, and can act as a deterrent to trading in capital markets. Internationally, regulators have realised such possibilities, and taken necessary steps to ensure that legitimate cases of self-trades do not get punished. The Indian regulator needs to undertake similar steps. Self-trades are generally considered to be non bona fide transactions. However, there can be instances where genuine trading intentions within the same firm result in self-trades. Such trades can occur in the course of normal trading when i) orders from two independent trading strategies coincidentally interact with each other, or orders originated from the same trading desk match with each other due to technical and operational limits of the existing infrastructure (such as matching engine technology). The following text illustrates such situations in detail. Proprietary trading firms typically have several dealers operating in multiple securities. These dealers, independently, deploy trading strategies to make profit and to manage their own risk. Orders from these independent dealer desks originate from accounts with common ownership. Such orders, though initiated with legitimate purposes, can result in self-trades. Under this strategy, arbitrage opportunities arise when the price of a security trading on both BSE as well as NSE diverges significantly. By selling the security on the exchange with higher price, and buying on the one with lower price, a trader can make arbitrage gains. In this strategy, the trader has a view about the direction of a security's price based on his analysis. If he anticipates that the price of the security is likely to go up in the future, he will buy that security. The trader makes a profit if the price actually moves upward at a later time-period. Suppose that at a certain point of time, Dealer 1 sees a significant divergence between NSE and BSE prices of a security, with higher price on NSE and lower price on BSE. He, thus, sends a buy order on BSE, and a sell order on NSE to pursue his arbitrage strategy. Dealer 2, at the same time, places a buy order on NSE in pursuit of his bullish strategy on the same security. Though completely legitimate, and without an intent to manipulate, the two buy-sell orders on NSE from two independent dealers can end up matching with each other. This trade, while being unintentional and completely co-incidental, when tracked at the legal entity level of the parent proprietary firm, will be characterised as a self-trade. The incidence of self-trades increases much more in the case of automated trading due to higher speed and the use of algorithms for making trade decisions. Similar to manual trading, two different algorithms within the same firm could be trading completely unrelated strategies. However, orders originating from these algorithms can also interact with each other without any malicious intention. Another source of legitimate self-trades could be technological limitations. Exchanges and trader terminals are situated at different physical locations which affect order placement and trade confirmation timings. Orders sent to two different exchanges could reach with a delay because of difference in the speed of computer network lines. This time delay is known as "latency". The arbitrage algorithm keeps sending buy orders to BSE and sell orders to NSE based on a price difference. For a particular set of orders, trade confirmation on one leg of the order is received from one exchange, but not from the second exchange. Meanwhile, the trader's algorithm sends a second pair of a buy and sell order to BSE and NSE respectively. Later, it is realised that the second leg of the first order on BSE did not get execution. The trader will, thus, have to reverse the executed position on NSE for the first order. To reverse the position, the trader sends a buy order to NSE. This buy order on NSE ends up interacting with the sell order sent in Step 3 resulting in a self-trade. All of the above are cases of self-trades that can occur within the same firm, but from separate or distinct underlying strategies with genuine trading interest. These examples show that it is wrong to think that all self-trading is market abuse. Self-trading in securities is a concern for regulators worldwide. It has, however, been recognised that such trades can also happen with legitimate purposes. As a result, regulators globally have made various changes to accommodate for such transactions. Transactions resulting from orders that originate from unrelated algorithms or from separate and distinct trading strategies within the same firm would generally be considered bona fide self-trades. "although self-trades between unrelated trading desks or algorithms are generally bona fide, frequent self-trades may raise concerns that they are intentional or undertaken with manipulative or fraudulent intent". FINRA issued guidelines for members to have policies and procedures in place that are reasonably designed to review their trading activity for, and prevent, a pattern or practice of self-trades resulting from orders originating from a single algorithm or trading desk, or from related algorithms or trading desks. "the rule will not apply to isolated self-trades resulting from orders originating from a single algorithm or trading desk, or from related algorithms or trading desks, provided the firm's policies and procedures were reasonably designed". In defining "related", FINRA stated its understanding that discrete units within a firm's system of internal controls typically do not coordinate their trading strategies or objectives with other discrete units of internal controls, but that multiple algorithms or trading desks within a discrete unit are permitted to communicate or are under the supervision of the same personnel and thus, are presumed to be related. It also stated that the proposed rule permits firms to rebut this presumption, suggesting that a firm could demonstrate that "related" algorithms or trading desks are in fact independent or are subject to supervision or management by separate personnel. Subsequently, after receiving comments from market participants on the proposed rule change, and minor amendments to the proposed law, the SEC approved the proposed rule change in May 2014. "Transactions in a security resulting from the unintentional interaction of orders originating from the same firm that involve no change in the beneficial ownership of the security, ("self-trades") generally are bona fide transactions for purposes of Rule 5210; however, members must have policies and procedures in place that are reasonably designed to review their trading activity for, and prevent, a pattern or practice of self-trades resulting from orders originating from a single algorithm or trading desk, or related algorithms or trading desks. Transactions resulting from orders that originate from unrelated algorithms or separate and distinct trading strategies within the same firm would generally be considered bona fide self-trades. Algorithms or trading strategies within the most discrete unit of an effective system of internal controls at a member firm are presumed to be related." "Wash trades: that is, a sale or purchase of a qualifying investment where there is no change in beneficial interest or market risk, or where the transfer of beneficial interest or market risk is only between parties acting in concert or collusion, other than for legitimate reasons". With no information barriers and no technological limitations, it will be optimal that trading firms implement mechanisms to prevent self-trades at their own end. However, such an ideal world does not exist. In such a scenario, could we demand that trading firms establish systems to ensure that self-trading does not happen? Since matching occurs at the exchange's order matching platform, and hence, some degree of self-trades could be difficult to detect at the trading firm's level. For example, when two separate dealers within the same firm send their orders to the exchange at different time points, those orders may still end up matching with each other if there are no other orders in the book. This can happen if one dealer sends a `buy' limit order at some point, while the other sends a `sell' market order at some later point of time. Similarly, if there is a large `aggressive' buy order sent by one dealer, and a normal sell limit order by another dealer which sits in the book, the `aggressive' buy order will first interact with the higher priority sell orders. If still some balance of this buy order is left, it may then end up matching with the second dealer of the same firm. In yet another case, it can also happen that one dealer sends a limit `buy' order at a point of time, but due to limitations in the exchange's order matching technology, it stands in the queue. After a point, another dealer from the same firm sends a 'sell' limit order and that order stands behind the first dealer's order. These two opposite orders can also ultimately end up matching with each other. With no malicious intent, in all the above cases, these self-trades are inadvertent and difficult to identify at a trading firm's level. Several exchanges including the NYSE, CME, Euronext, Canadian Securities Exchange, ICE, NASDAQ have implemented self-trade prevention (STP) mechanisms that alert the traders to the occurrence of a self-trade from the same member, and let them make a choice to either, cancel the resting order, or the aggressive order. Some of the exchanges including the ICE and NASDAQ give the a choice to opt for the use for this service at either the company, group, or trader level. In India, BSE introduced a similar system in January 2015 on its equity derivatives and currency derivatives segment. It extended the facility to the equity segment in March 2015. NSE will be introducing self-trade prevention mechanism in the currency derivatives segment starting August 3, 2015. The systems, on both the exchanges, however, only cancel the incoming (active) order of the client. Under the current regulatory framework, Regulation 4(2) of the Securities and Exchange Board (Prevention of Fraudulent and Unfair Trade Practices of Securities) Regulations, 2003 (SEBI (FUTP) Regulations) prohibits a person from indulging in a fraudulent or unfair trade practice. (g) entering into a transaction ...without intention of change of ownership of such security;..."
Since the buyer and seller in a self-trade are the same entity, there is no change in ownership of the shares. Clause (b) of Regulation 4(2) prohibits self-trades originated with manipulative intentions. We outline a case below and highlight how SEBI has failed to provide sufficient evidence of market manipulation, and refused to recognise co-incidental and unintentional self-trading activity which occurs (a) within a firm or (b) as a result of algorithmic trading. "It may be noted that these different CTCL ids belong to the same Stock Broker / legal entity i.e., noticee, therefore, matching of trades amongst them will have to be considered as a 'self-trade'." "Further, the argument of the noticee that final trader id may be identified by CTCL id is not the right interpretation and the self-trades at the member level has to be considered because the UCC for each client is different in case of trading for clients whereas in the case of proprietary trading the trades are executed in member's 'PRO' code irrespective of number of dealers / traders employed to execute the proprietary trading." The AO, here, considered a proprietary firm's trading activities solely from the viewpoint of the legal entity, and not at the trader id or dealer level. As described above as legitimate cases, self-trades occurring from unrelated trading desks, and functioning independently may not be manipulative, and need to be considered separately. Exchanges themselves, register the user id and terminal ids for each dealer. It is therefore, inappropriate to not consider trades at the level of traders or terminals. "... the total self-traded volume is 78,927 shares at BSE and 38,229 shares at NSE which is very high." "The number of instances of self-trades executed by the Noticee is extremely high i.e. 6,051 trades at BSE and 2,985 trades at NSE which is not miniscule by any stretch of imagination as contended by noticee." The AO states that there was a very high scale of self-traded volume. The said volumes are respectively 0.53% and 0.10% of the total quantity traded that day on the security on BSE and NSE. SEBI failed to establish materiality by comparing these numbers to an appropriate benchmark. The Securities Appellate Tribunal (SAT) has, previously, refused to acknowledge unintentional self-trades that emanate from independent terminals and traders, and has obligated firms to prevent self-trading by all means. "..Trades, where beneficial ownership is not transferred, are admittedly manipulative in nature". "Self-trades admittedly are illegal. This Tribunal has held in several cases that self-trades call for punitive action since they are illegal in nature." "The buyer and the seller were also the same. It is obvious that these trades were fictitious to which the appellant was a party. They were fictitious because the buyer and the seller were the same." In India, FUTP regulations do not deal with legit self-trading activity which may happen within a firm without intent of manipulation. Since there is no clear law which deals with self-trades specifically, even genuine self-trades activity often falls under the "unfair trade practice" category. In light of these issues, the following changes are proposed as a solution to deal with self-trading activity. Clause (g) of 4(2) treats all self-trades as manipulative and should be removed. Transactions in a security resulting from the unintentional interaction of orders originating from the same firm that involve no change in the beneficial ownership of the security, generally are bona fide transactions. Transactions resulting from orders that originate from unrelated algorithms or separate and distinct trading strategies within the same firm would generally be considered bona fide self-trades. Algorithms or trading strategies within the most discrete unit of an effective system of internal controls at a member firm are presumed to be related. Members must have policies and procedures in place that are reasonably designed to review their trading activity for, and prevent, a pattern or practice of self-trades resulting from orders originating from a single algorithm or trading desk, or related algorithms or trading desks. Before starting the investigation, the number of shares traded via self-trades should be significant i.e. above an appropriate benchmark, in terms of volume and value of transactions. The regulator should be able to reasonably demonstrate the impact of self-trades on the price. Patterns and practice of self-trades should be looked at before considering them as manipulative. Exchanges should implement Self-Trade Prevention systems and offer these services to its members on a voluntary basis. The regulator should issue guidelines regarding self-trading in line with the proposed changes to the law. These rules need to be woven into the internal process manuals at SEBI on enforcement against market abuse. At present, subordinate legislation by SEBI, enforcement actions by SEBI and rulings at SAT are unanimous in viewing all self-trading as being synonymous with market abuse. In this article, we have demonstrated that this presumption is incorrect. Some but not all self-trading is market abuse. Financial regulators elsewhere in the world have obtained greater precision in enforcing against market abuse while not punishing legitimate actions. We have shown actions that need to be undertaken at SEBI on the legislative and the executive side in order to address this problem. The discussion above has been couched in the language of the equity market, which is the most sophisticated component of the Indian financial system. It is, however, completely general and pertains to all organised financial trading. As an example, if SEBI implements the above improvements, all this progress will immediately accrue to commodity futures as SEBI is now the regulator for commodity futures trading also. In the future, when the Bond-Currency-Derivatives Nexus moves from RBI to SEBI, similar gains will accrue there also. We thank Pratik Datta, Shubho Roy, Anjali Sharma, and Susan Thomas for their valuable comments. What does algorithmic trading do to market quality?, 1 September 2014. What role is played by commodity futures in India?, 10 September 2014. When the Financial Sector Legislative Reforms Commission (FSLRC) produced the draft Indian Financial Code (IFC) in March 2013, the Ministry of Finance put it out for public review and comments. This version is informally termed IFC v1.0. Hundreds of comments were received on this first draft. Justice Srikrishna and his team worked on these comments and have come out with a revised draft Indian Financial Code. This is informally called IFC v1.1. Today, the Ministry of Finance has put this revised draft out for public review and comments. IFC v1.0 was the result of a thorough and careful process. Even though enormous time and effort was put into it, with the benefit of hindsight, it had numerous blemishes. With the benefit of hindsight, I feel that within IFC v1.0 there were many projects running in parallel, and their inconsistencies of approach were visible in the final product. IFC v1.1 is a polished product. With the benefit of 853 days of elapsed time, many blemishes have been found. The code is much more orthogonalised: general concepts are consistently applied. It now reads as simple and precise English. I can't think of many laws in India which match the quality of thinking and drafting of IFC v1.1. The first element is the legislative process that should, at some point in the future, lead to Parliament enacting the Indian Financial Code. The February 2015 Budget Speech by Arun Jaitley said he will table this in Parliament `sooner rather than later'. The release of IFC v1.1 today is an important milestone in this legislative track. The third element is to treat FSLRC as the strategy and chip away at incremental changes within the existing legal framework to move towards this goal. This also builds institutional capacity, and reduces the complexities after the law is passed. It front-loads the gains: why not reap the fruits of improved financial sector policy sooner rather than later? Elements of this include: (1) The FSLRC Handbook, (2) the SEBI-FMC merger (backdrop and then Budget 2015), (3) shifting regulation-making power on non-debt capital controls from RBI to MOF (Budget 2015), (4) inflation targeting as the objective for RBI, (5) Finance SEZs, (6) Appeals against all financial agencies other than RBI at a tribunal named SAT. At present, five task forces are in motion -- to build the Financial Sector Appellate Tribunal (FSAT) that will hear appeals against all financial agencies, the Public Debt Management Agency (PDMA), the Resolution Corporation (RC), the Financial Data Management Centre (FDMC) and the Financial Redress Agency (FRA). Each of these five projects would take over three years from start to finish. One one hand, this is frustratingly slow. We need the FRA or the FSAT or the PDMA or the FDMC or the RC yesterday. But it's not possible to do these things in reduced time. The time horizons for these projects are consistent with the time horizons for IFC to go through the parliamentary process. What is the role of WPI in monetary policy? The RBI just can't seem to catch a break. Try as it might, it just can't seem to escape controversy, even over issues that in other countries are not exactly controversial. Take the case of which particular inflation index the RBI should use as its target. For an entire decade, people debated ferociously over whether the target should be the CPI or the WPI. Finally, about a year ago it seemed that all the arguments had been exhausted and a consensus had been reached that the CPI was best. So, Governor Rajan announced that henceforth the RBI would target the CPI. Case closed? Not at all! It turns out that reports of the debate's death had been greatly exaggerated. On July 9 the Business Standard reported that a growing chorus of businessmen and analysts are complaining that CPI targeting has led the RBI astray, causing it to set interest rates too high. They want the RBI to target the WPI, which shows that prices are actually falling. Did the RBI make a mistake? To answer this question one needs to go back to basics, and think about what monetary policy is trying to achieve. The main goal of monetary policy is to provide a particular service to the population, the service of ensuring stable prices. This task is of such importance that the RBI was set up as a special institution, organisationally distinct and geographically separate from the government. When that set-up did not prove sufficient to safeguard low inflation, further reinforcements were put in place. The RBI adopted a formal inflation targeting regime, and the government in turn promised to provide the central bank with the operational independence needed to achieve the agreed inflation target. The Monetary Policy Framework Agreement, which was signed by Finance Secretary Rajiv Mehrishi and RBI Governor Raghuram Rajan on 20 February 2015, creates this formal arrangement. All this is being done because price stability is critical to the welfare of the population, especially the weaker sections who suffer badly whenever the prices of their necessities rise. So far, so good. The problem comes when one needs to translate the universally agreed objective of price stability into a specific monetary policy stance. To do this, one needs three things. First, a specific measure of inflation. Second, a definition of what it means for this measure to be “stable”. And third, a framework (which could be based on an econometric model) for deciding what level of interest rates would best achieve the inflation objective. In other countries, most of the debate has centred on the third issue, whereas the first two have proved relatively easy to address. Virtually all inflation targeting central banks define price stability as inflation somewhere between 2 percent and 5 percent. And they measure inflation using the CPI, because the objective is to improve consumer welfare, and the index that measures the price of consumption goods is the CPI. In contrast, WPI is only distantly related to consumer welfare. For a start, it is unclear what the WPI is actually measuring. Its coverage is extremely limited, encompassing only the commodity-producing sectors and completely ignoring services, which constitute more than half of the economy. The few sectors that are included are then weighted according to their gross value of production, not their value-added. Consequently, the index is deeply unrepresentative of the economy. But let’s suppose the RBI were prepared to ignore these theoretical issues. It would run immediately into some very practical difficulties. Since the WPI consists mainly of commodities, the movement of this index is heavily influenced by developments in world markets, which the RBI cannot control. The RBI cannot determine the dollar price of oil. And while it can influence the rupee price by controlling the exchange rate, this is a dangerous strategy, as the East Asian countries discovered at their peril in the late 1990s, when their exchange rate pegs collapsed in crisis. So, the reality is that the RBI cannot control the WPI, and should not try to do so. Does that mean the RBI should just ignore the WPI? Not at all. Recall that achieving price stability – even if measured solely by the CPI – requires a framework for figuring out what level of interest rates is required to obtain this objective. And this is where the WPI does indeed come in, as do various other measures of prices. Just not in the way that the analysts quoted in Business Standard argue. According to them, interest rates have been set on the premise that the economy and inflation are proceeding apace (as indicated by the rising CPI), whereas in reality manufacturers' prices are falling (as shown by the declining WPI). So firms are getting squeezed between high interest rates and low prices. Firms may well be suffering from a profit squeeze. In fact, the corporate results suggest they are. But you can’t prove this by citing the WPI. That’s because the WPI does not measure output prices, the prices at which firms are selling their goods. The index that does this is the PPI, or producer price index, which unfortunately does not exist for India. Rather, the WPI is essentially a measure of input prices, because it consists mainly of commodities, which are largely inputs into production. Accordingly, a falling WPI actually increases firms' margins, improving their profitability. (Think: oil.) As a result, there’s no need, at least not from the falling WPI, to compensate firms in the form of lower interest rates. That said, there is a kernel of truth in what the Business Standard analysts are saying. To see this, let’s go back to basics again. Very broadly, inflation occurs when aggregate demand exceeds aggregate supply. And aggregate demand is influenced by many factors, including many different price indices. Consumption decisions depend in part on interest rates adjusted for CPI inflation. Export demand depends partly on interest rates less export price inflation. And investment demand is influenced by the difference between interest rates and PPI and WPI inflation. Summing up all of these factors is impossible to do intuitively. That’s why central banks employ large econometric models to guide their policymaking. So, in the end, the analysts quoted in Business Standard have a point. The WPI and its attendant data bank of price time series, should be taken into account, indeed perhaps is already taken into account, in the RBI’s policy-making framework. But it cannot be the object of this framework. The sole inflation target should be, indeed must be, the CPI. After more than a decade, it is really time to put this debate to rest. When a person seeks treatment from a doctor, he may worry about medical expenses or test results. What he probably does not worry about is a third party paying the doctor to actively damage his health, by providing unsuitable advice or administering an inappropriate medical product. In consumer finance, however, this happens all the time. Customers approach those perceived as finance experts for advice on financial products, or to buy these products. These experts often provide unsuitable advice or inappropriate financial products to the customers, because a third party is paying them to do so. This problem is present across a large swathe of Indian household finance. As an example, a careful examination of one episode of one class of mis-selling problems has showen an estimated loss to investors of Rs. 1.5 trillion, or USD 28 billion from 2004-05 to 2011-12. The customer, who may potentially buy the product. While `financial intermediary' in general covers all financial firms, in the present context, it refers to the persons who engage in the front-end seen by customers, and not the financial firms such as mutual funds who produce the product upstream. Just as the doctor plays both the role of providing medical advice to the patient, and occasionally that of distributing the medicine provided by the product supplier, intermediaries perform two roles in the Indian financial distribution system: they perform advisory services for customers and provide distribution services to product providers (such as mutual funds and insurance firms). How is retail finance different from health? The first key difference is that, unlike in the health setting, intermediaries in India sell financial products to customers but earn commissions from the product suppliers. Intermediaries are likely to focus on the potential commission they can earn when selling a particular product, rather than catering to the best interest of customers. In the health sector, this situation is less prevalent as the intermediary (i.e. the doctor) earns his income from the consumer (i.e. the patient), and not the service provider (i.e. the company providing the medicine); the doctor's financial incentives are driven by patient satisfaction. Several retail finance mis-selling episodes can be traced back to this arrangement. While advice may not be explicit, given the nature of the products, it is embedded in the distribution. The advisory role is particularly important considering that India has an estimated 65% of the population that is financially illiterate. Second, unlike in the health sector where the type of doctor (and the type of service they are qualified to provide) is clearly defined, the retail finance distribution system in India lacks these definitions. This allows for gaps and overlaps in the type of intermediary, and therefore the service they provide (e.g. whether an intermediary is a qualified financial advisor, or just a salesperson, needs to be clearly defined before the consumer can make an informed choice on whether to take the intermediary's advice). While a patient would ordinarily not seek advice on a heart condition from a gynaecologist, a retail finance consumer may find himself taking advice from an intermediary not qualified to provide that advice, as regulations governing the type of intermediary, and therefore the type of services they are qualified to provide, are weak. Third, a retail intermediary can play both the role of the salesperson and the advisor, because the retail finance advisory market is underdeveloped. Usually, a patient actively seeks medical advice from a doctor when he is in need of it. Medical products are therefore pull products. Under the present arrangements, the same patient may never seeks advice in the retail finance sector. This has made retail finance in India a zone of push products. This has given two groups of problems: The lack of demand for advice has hampered the development of the advice industry and the pervasive supply of advice by conflicted intermediaries is leading to bad decisions by households. Fourth, grievance and redress mechanisms in the retail finance sector are underdevloped and inconsistently applied. Currently, each regulator is responsible for providing redress relating to products under their jurisdiction. As a result, there is no standardised service for redress, especially for consumers of complex products that fall under more than one jurisdiction. In the health sector, the ethical incentive to ensure a patient's health is maintained has resulted in enforced regulations aimed at curbing malpractice; if the doctor were to intentionally administer the wrong medicine, it is likely he would face consequences for his actions, as institutions that allow for redress are already established and developed. This factor leads to mis-selling as, unlike in the health sector, intermediaries know they are more likely to get away with selling an unsuitable product to a consumer, or giving inappropriate advice. In the study of how mis-selling is being treated in other jurisdictions, we often turn to the UK or Australia. An interesting case study on this subject is South Africa, a country whose financial system is more comparable to India. The South African financial distribution system has suffered from large scale mis-selling. The country's financial literacy rate is estimated to be 34% (comparable to India's 35%), and the financial distribution regulatory framework has not been effective in protecting consumers. The 2002 Financial Advisory and Intermediary Services (FAIS) Act made progress in raising intermediary professionalism, improving disclosure to clients and mitigating certain conflicts of interest. However, poor customer outcomes and mis-selling of financial products persisted. As a result, the South African Financial Services Board (FSB) initiated its own Retail Distribution Review, the findings and proposed recommendations of which were published in November 2014. First, it looks at services provided by intermediaries. The RDR proposes clearly defining the types of services provided as advice (which is a service to the customer); intermediary services (which are services connecting product suppliers and customers); and other services provided by advisers and intermediaries (which are services to product suppliers). Further, the RDR defines types of advice an intermediary can provide. The RDR then sets proposed standards for each type of advice, including intermediary disclosure requirements and steps for mitigating and managing certain conflicts of interest. Second, the RDR looks at the relationships between intermediaries and product suppliers. In line with defining the types of advice offered, the RDR proposes definitions for the types of advisers, based on whether they are tied to one or more product supplier, or if they are independent. The RDR also sets proposes qualifying criteria for an adviser to be fully independent based on the products offered; the product supplier in connection with these products; and level of influence from product suppliers. Standards for product suppliers' responsibilities are proposed for each type of adviser as well as for non-advice sales. Third, the RDR looks at the remuneration earned for the services concerned. Among the proposals relating to remuneration, the most notable is the one banning commissions for all investment products, which comes only after the recommendations for reconstructing the retail distribution system. The recommendation states that: Product suppliers will be prohibited from paying any form of remuneration to intermediaries in respect of investment products, and from including any costs associated with intermediary remuneration in product charging structures, whether in the form of ongoing charges or early termination charges. Intermediaries will correspondingly be prohibited from earning any form of remuneration in respect of investment products other than advice fees agreed with the customer, in accordance with the applicable requirements for such fees. South Africa's financial distribution system is complex and lacks clear structure. As a result, creating legislation to address mis-selling without first restructuring the distribution system (including defining services provided and relationships between intermediaries and product suppliers) has failed as a solution, as demonstrated by the FAIS Act. A sound distribution framework needs developing before implementing changes to commission structures can be fully effective. This entails conducting a thorough review of the current retail distribution system in India, developing a clear understanding of retail distribution dynamics, and then establishing rules and regulations on the types of services provided by intermediaries; their relationship with product suppliers; disclosure norms; and qualifying requirements. Effective grievance and redress mechanisms that are consistently applied nationwide across the retail finance sector (regardless of which regulator's jurisdiction a financial product comes under) need to be developed. In the short run, consumer protection thinking will need to be grafted on top of the present legal framework in India, which was not designed with consumer protection in mind. Financial agencies are in the process of adopting the FSLRC Handbook where Chapters 2 and 3 are about consumer protection. This article should feed into this work process. The fuller solution, however, requires the Indian Financial Code (IFC). The IFC approaches retail finance with consumer protection as an objective, making it the regulator's responsibility to create regulations for these consumer protection provisions. The IFC defines "advice" as a "recommendation, opinion, statement or any other form of personal communication directed at a consumer that is intended, or could reasonably be regarded as being intended, to influence the consumer in making a transactional decision". Further, it defines a "retail advisor" as a "financial service provider or financial representative that gives advice to a retail consumer". The draft law then gives the regulator powers to discharge its functions with the objective of protecting and furthering consumer interests, and promoting public awareness of financial products and financial services. The IFC then places the responsibility of making regulations for these provisions to the regulator. Under the IFC, the regulators could thoroughly review and reconstruct the retail distribution framework within these bounds. The Ministry of Finance has established a task force aimed at creating the Financial Redress Agency (FRA) of India, as envisaged in the IFC. The FRA will be a nationwide independent agency providing redress for financial consumers across all sectors, with the ability to handle large volumes of relatively low value complaints. While this addresses the grievance redress aspect of the problem, other provisions in the IFC facilitate the second aspect, and allow for the retail distribution system to be reconstructed. I thank Renuka Sane for valuable discussions. For years I’ve been saying “the ‘conventional wisdom’ in the field of international (or ‘global’) health is so weirdly innocent of elementary economics that no real economist who has thought about it at all could possibly support it.” By ‘conventional wisdom’ I’d include all unconditional talk of free curative primary care. Well, recent events have proved me as wrong as it is possible to be. In a recent Lancet article (OK, that’s a clue), Dean Jamison (no surprise there) is lead author of a paper reporting on the conclusions of a committee chaired by Larry Summers that included Kenneth Arrow and George Akerlof. It is the same old sh…stuff that unconditionally calls on every country, no matter what their circumstances, to commit to Universal Health Care where such a commitment must imply free curative primary care. It is no longer tenable for me to contend that no ‘real’ economist would say such a thing after thinking about it since we are now talking about two Nobel Prize winners and Summers after having being on a committee dealing with that very topic. So, the argument has to be made explicitly to let people think this through for themselves. This is a minor, realistic, modification to public economics and is just to take the constraints on government policy seriously – both administrative and political – if such constraints will interfere with getting the policy done at all. Implementation matters. This is just common sense but it does involve some not-so-easy, if common, considerations. Politics is something I usually just rule out of bounds of my expertise but in justifying spending money (no matter how badly) in public health I regularly hear “oh, well, the money will come out of defense so it has no real opportunity cost.” No. It won’t. Or, you’d better be sure before you start. On the administrative side: some policies are relatively easy – they can be done with the stroke of a pen or with easily written and monitored contracts. Monetary authorities can buy government bonds; most governments can get a road built (yeah, I know, that’s not always so straightforward either). Other policies are really hard. Monitoring CO2 emissions from fixed-point locations (let alone cars), identifying and updating lists of poor people, making sure school teachers are child-centric and, of course, making sure primary health care providers show up for work and apply some due diligence to their job. Some of these are really, really hard. Governments should know their own capabilities and promise those things they know they can follow through on before making promises that can’t be kept. Good public policy has to make choices based on both considerations. Given different circumstances as far as the epidemiological profile of countries are concerned as well as substantial differences in the capacity of their governments (both of which – epidemiological profiles and government capacity - change), it is impossible to predict, before a careful analysis, which set of policies would be appropriate in which circumstance at any particular point in time. Some governments might be able to get regulation or infrastructure done well, others might have an advantage on health or education (Cuba or Iran come to mind). There is no reason to believe that all governments are equally well prepared to handle all possible public tasks. However, when “universal health care” is advocated irrespective of country circumstances, its very “universality” runs counter to this commonsensical approach. From my perspective, two gigantic market failures characterise health markets (and problems) in poor countries. The first is the continued existence of communicable diseases many of which are combated by true public goods (or close enough). Traditional, 19th century public health problems of water, sanitation and pest (vector) control and a few immunisations were handled (or were acknowledged that they should be handled) by public authorities since the germ theory of disease was discovered. Many of these are still not done in poor countries (who now have a few more effective immunisations to work with). I work a lot in India. Open defecation in India is a massive problem, currently being documented at length by researchers. Let me call attention to the Research Institute for Compassionate Economics in Delhi for this. The lack of sewers and sewage treatment in rapidly growing cities threatens the world with catastrophes that make Dickens’ London look benign. Can we pretend we don’t know what to do about this problem, at least in urban area? Can we pretend that money for such immediate demands will not be compromised if more money is to go to medical care? At least in some countries? Without being sure that there is no tradeoff with primary care in a country’s budget (I can attest there is such a tradeoff in India) – the “universal” part of universal health care is … irresponsible at best. So, on conventional economic grounds, there is a very good argument for government intervention on public goods and on the risk/ insurance/ hospital set of problems. Not prima facie on primary health care (medical, curative) that is implied by “universality”. Whether health care is particularly important for poor people (not from protection from risk – that falls into the insurance problem that everyone faces) must be evaluated against everything else governments might do to rectify an unfair distribution of income. Health care is not an obvious choice in comparison to food, for example, or unconditional cash transfers. I will elaborate in another post. On grounds of the variable degree of difficulty of administering different public policies, this can’t be constant across countries and can’t be assumed to justify publicly provided or insured primary care. From evidence that money often fails to reach clinics (Gauthier and Wane) to absenteeism (Kremer et al, Chaudhury et al)) to poor quality care (Das and Hammer, Das et al) to substitution with large private sectors (sorry, cross effects, of prices or distance, of public and private sectors are really hard to pin down and largely unknown but often suspected to be large since people shop around for both (Filmer et al, Leonard)) makes the net impact of public efforts to provide primary care very doubtful in general and, in any case, questionable frequently enough to make advocacy of universal provision … irresponsible at best. In future posts I will elaborate on the distributional effect of public spending on health, on the track record of primary care provision and on the challenges of correcting insurance market failures mostly from a public administration/ public capacity perspective. For now I just want to flag the point that advocacy of a single policy prescription for every country of something that is questionable for each of those countries is… irresponsible at best. Anirudh Burman is a researcher at the National Institute for Public Finance and Policy. Privacy, Aadhaar, Data Protection: Statist Liberalism and the Danger to Liberty, 14 September 2018. How well is India's land record digitisation programme doing: Findings from Rajasthan, 14 December 2017. Problematic terms in the demonetisation debate, 25 November 2016. Building the institution of Insolvency Practitioners in India, 25 December 2015. New moves in regulating warehouses, 30 June 2015. Farmers avoid going to mandi because the transportation charges, loading and unloading charges make the entire deal unviable. If WDRA registered warehouses could be recognised as sub-market yards as suggested in this article, then the distance between farmers and buyers could be reduced. Farmers could use warehouses as a point of storage until the time the market turns favourable. In the meantime, the stock could be pledged to avail loans from banks. Currently, the warehousing market largely offers a physical storage receipt against which farmers can get their stock financed. Banks lien the stock, place an external collateral management company to secure the quantity and quality of stock. With negotiable warehouse receipts issued by WDRA-registered warehouses, farmers would be able to transfer the ownership of their commodity without having to make physical deliveries. This will save costs for farmers and encourage them to store their crops in warehouses. I am grateful to Amey Sapre for insights. In both cases, policy makers did not get the basics of economic policy in a market economy. An analysis at the Finance Research Group, IGIDR aims to provide a few insights on the proliferation of HFT (or AT) in the Indian markets. Using a unique tick by tick orders and trades dataset from one of the most liquid stock exchanges in the country, the National Stock Exchange (NSE), we examine how AT/HFT has changed the equity market structure in India. In addition to the usual details of price and volume, the data contain details of whether an order was sent by an AT or a non AT, and whether the order was a new order, or an old order that was modified or cancelled. A clear demarcation of orders sent by AT versus non AT, enables us to examine the characteristics of how AT's trade in the markets vis-a-vis non AT. Between the two periods, percentage of orders entered by algorithmic traders increased from 11.36% to 62.76% on equity spot, from 38.93% to 93.72% on single stock futures (SSF), and from 21.29% to 86.79% on single stock options (SSO). On the most liquid segment of NSE, that is the Nifty options, the percentage of new orders entered by AT increased from 19.60% to 93.56%. On Nifty futures contract, it increased from 21.57% to 91.23%. The values indicate that a large proportion of the orders that are entered on NSE today are by algorithmic traders (AT). A majority of these orders are limit orders, indicating that instead of going for the special orders that the exchange offers, AT prefer the traditional limit orders which offer them greater flexibility to manage their orders. Do AT supply liquidity or demand liquidity? The increase in percentage of AT orders in the market raises the concern on whether that increase corresponds to a similar increase in liquidity supply, or, whether they consume liquidity from non algorithmic traders. For each segment on NSE, we analyse the percentage of trades in which AT supplied liquidity versus the trades where they demanded liquidity. When an order that comes to the market trades against an existing order in the book, the new order is said to have taken (demanded) liquidity, while the existing order is said to have provided (supplied) liquidity. The graph above indicates the share of AT orders in total liquidity demanded increased across all the segments between the two periods. However, this matches with their share of orders in total liquidity supplied to the market in all except the Nifty options market. We further break this analysis into who supplies liquidity to whom. This is depicted in the following graph. In the above graph, the top-left panel indicates the percentage of trades in which AT demanded liquidity from another AT. 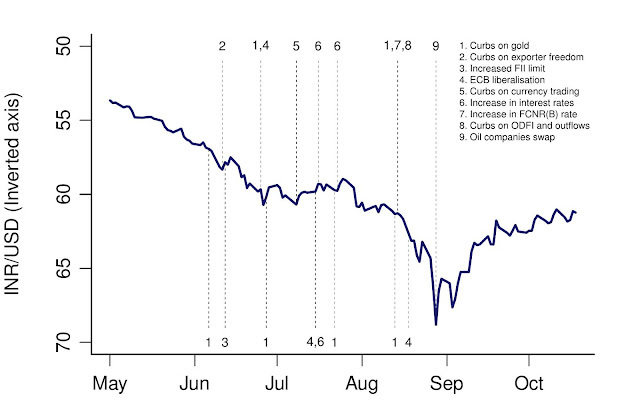 On the spot market, for example, AT took liquidity from other AT in 6.34% of trades in 2013. The top-right panel indicates the percentage of trades in which non AT demanded liquidity from AT. The bottom left panel indicates the percentage of trades in which AT demanded liquidity from non AT. Finally, the bottom right panel indicates the percentage of trades in which non AT demanded liquidity from non AT. A difference in the values in the bottom right panel from 100 indicates the AT-intensity, that is the percentage of trades that occurred on NSE in which AT was either on one or both sides of the trade. 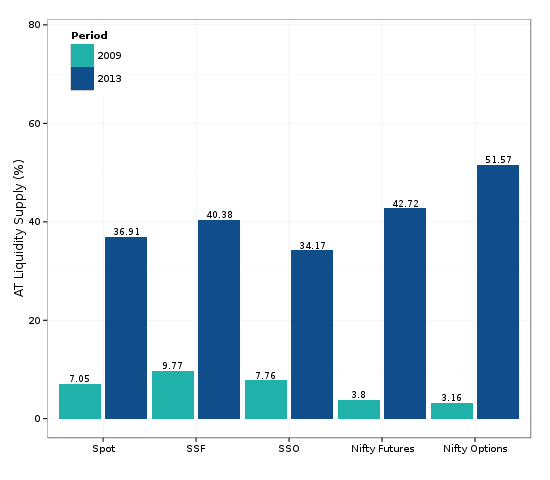 For example, on the spot market, in 2013, the percentage of trades in which AT were present atleast on one side of the trade was (100 - 44.3)% = 55.7%. Of particular interest are the top-right and bottom-left graphs. These two graphs indicate non AT demand for liquidity from AT, and AT demand for liquidity from non AT, respectively. The values in the graph reinforce the observation that AT demand as much liquidity from non AT as they supply to them for all except the Nifty options market.1 This suggests that the concern that AT consume liquidity from non AT does not hold. We now proceed on to examining how the order placement strategies of AT have changed the market structure on NSE. Q:1 How have order placement strategies changed after faster market access? With a majority of the orders coming from AT, we first examine if there has been a change in the order placement strategies by market participants. Specifically, we examine if the increase in the number of orders has translated into a larger number of trades, or are most of the orders that are entered are eventually cancelled? The table below indicates the percentage of orders that get traded and cancelled by AT and non AT. The first row in the table indicates the percentage of orders entered by AT. As discussed eariler, the share of AT in the total number of orders sent to the NSE has risen significantly. The second row in the table indicates the percentage of AT orders that got traded. The table shows that the increase in percentage of new orders entered by AT is not matched with a higher percentage of orders that got traded. Instead, we see a decline in the percentage of traded orders across all the five segments (spot, SSF, SSO, Nifty futures, Nifty options). For example, on the spot market, the percentage of orders that got traded declined from 60.02% in 2009 to 38.06% in 2013. We also find a significant increase in the percentage of orders that got cancelled in the high AT period (2013). Of the total unique orders that came to NSE, the percentage of orders that got cancelled increased from 30.06% in 2009 to 56.97% in 2013 on the spot segment, from 82.40% to 94.11% on the SSF and from 63.70% to 88.55% on the SSO. On Nifty futures, this percentage increased from 47.66% to 81.58% and on Nifty options from 63.37% to 87.51%. 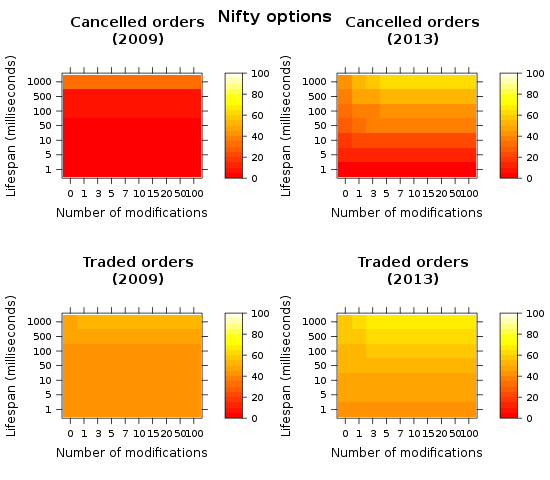 While there could be legitimate reasons for such cancellations (Hasbrouk and Saar, 2009), the increase in the percentage of cancelled orders raises concerns about phantom liquidity (also known as spoofing, flickering quotes, or fleeting liquidity), that is, the fear that high speed access allows the trader to post an order for everyone to see, but withdraws it before anyone can act on it. We examine this concern in the next question. Q:2 Do order cancellations occur at very short intervals? Higher percentage of order cancellations, by itself is not a matter of concern. The concern instead is that these orders might be getting cancelled in such short a time that other traders, who do not have the advantage of fast market access, are unable to execute their orders against such orders. Or, these orders could be sending signals of false liquidity. In order to pin down these concerns, the evidence of cancellations needs to be combined with evidence of speed of cancellations - or the lifespan of the orders. If a majority of the orders are cancelled in very short time intervals, then it could be suggestive of phantom liquidity in the markets. The graphs above indicate the percentage of orders that got cancelled in less than a second on the two most liquid NSE segments: Nifty options and single stock futures (SSF). 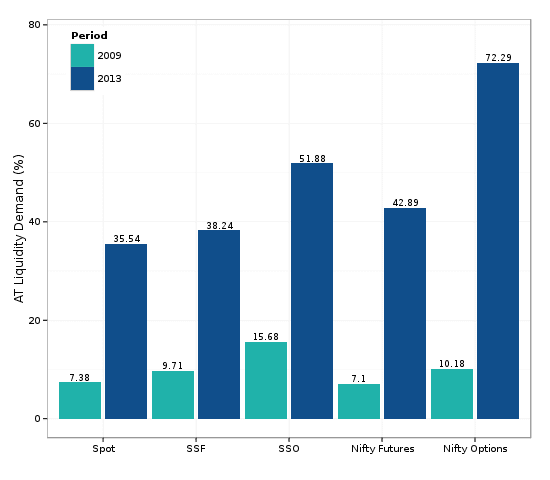 The graphs suggests that in the high AT period (2013), more than 70% of the orders entered on the SSF and about 54% of the orders entered on the Nifty options market got cancelled within a second.2 These values are substantially higher than the values in the low AT period of 2009, during which 7.83% and 14.96% of orders got cancelled within one second on SSF and Nifty options. ``If the speed of cancellation is much quicker than the speed at which those quotes can be accessed, then I would say quote cancellations are not only fast, but perhaps they are too fast. However, if market participants can lift quotes just as quickly as others can cancel them, I would say that the cancellations might be fast, but not necessarily too fast." ``If quote cancellations are indeed too fast for the rest of the market to keep up, it might make sense to slow down this particular aspect of the markets, perhaps with some sort of minimum quote-life requirement. But it the data shows that at least some market participants can access quotes just as quickly as they can be canceled, this suggest that both sides of the market are very fast and if you want to slow down the market -- in a way that does not bias one side, you would need to not only address the speed of quote cancellations, but also the speed at which liquidity is taken." We examine this by comparing the lifespan of cancelled orders with that of the traded orders. We once again restrict our discussion to the two most liquid segments on NSE: Nifty options and SSF. A majority of the orders that get cancelled do not undergo large number of modifications. Access to speed has indeed increased the speed of order cancellations, but this speed is lower than the speed of execution. The Nifty options inferences do not however hold for the SSF. 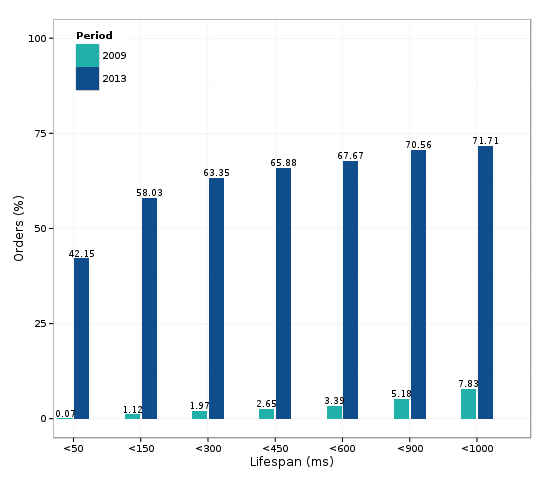 In 2009, the percentage of cancelled orders within a lifespan of less than a second on SSF was almost negligible, while the percentage of traded orders within the same lifespan was less than 40%. The numbers changed dramatically in 2013. The graph shows a shift from red to yellow region for cancelled orders, but only a shift from red to orange region for traded orders. 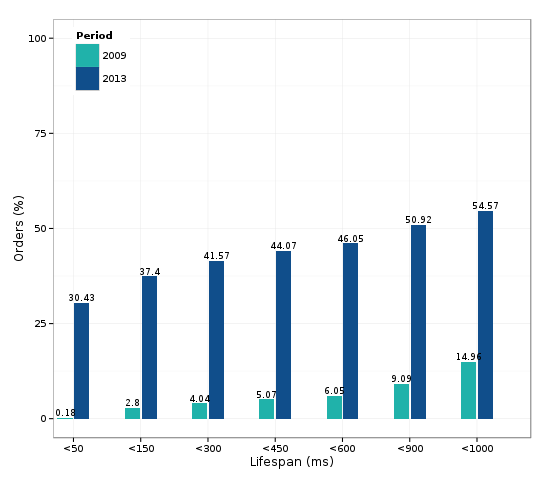 The percentage of cancelled orders with a lifespan of less than a second was about 75%, while the percentage of traded orders within the same lifespan was about 45%. This indicates that the speed of order cancellations surpassed the speed of trade executions in 2013. The share of algorithmic orders in total orders that come to the market has risen significantly. 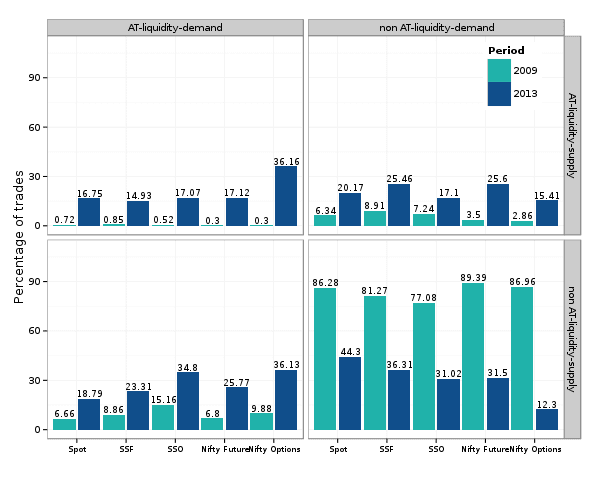 Except for the Nifty options market, the share of algorithmic traders in liquidity demand matches with their share in liquidity supply. A large majority of the orders on NSE are cancelled, with most of them occurring within a second of order entry. The speed of order execution is higher than the speed of order cancellations on Nifty options. This is however not true of the SSF segment of the NSE. The above analysis does imply that the order placement activities have changed significantly with a lot of cancellations occurring within short time-frames. However, to analyse whether this degree of cancellations could be hurting the other market participants, it is critical to examine the where these quote cancellations occur? If most of these cancellations are occurring around the best bid and ask prices (or even the upto level 5 depth of the market), such cancellations could be a cause of concern. Further analysis aims to capture this aspect. The causal impact of algorithmic trading on market quality by Susan Thomas and Nidhi Aggarwal, 2014. IGIDR Working Paper. HFT and market quality by Biais B and Foucault T, 128, 2014 in Bankers, Markets and Investors, p. 5-19. 1. The reason for the difference in the nature of AT liquidity demand and supply on the options market needs further investigation. 2. We record similar values for the rest of the market. 3. The findings are also comparable to studies investigating fleeting orders. For example, Hasbrouck and Saar (2009) find that 36.69% of the limit orders get cancelled in less than two seconds on INET. Suppose a government is unhappy at the price or quality of wrist watches that are being made in the private sector. Should the government indulge in muscular interventions into the free market's outcome? The standard thinking of public economics runs in three steps: (1) What's the market failure? (2) What's the proposed intervention; does it attack the market failure at the lowest possible cost and (3) Do we have the State capacity to pull off this intervention? Suppose you wanted to diverge from the orthodoxy. Parliament can write a law which uses coercive power to meddle in the wrist watch industry. This is called "industrial policy". It can decide that quartz movements are a better technology, and ban mechanical watches. It can put people in jail if watches are traded at a price that is different from the price specified with the government. What is wrong with undertaking such interventions? The problems with such interventions run at three levels. First, the free market works pretty well, and even well meaning politicians and officials have little value to add (other than addressing market failures). Second, politicians and officials may not be well meaning uncles, they are regular guys and chase their own selfish objectives. Third, even if the right objectives are established, implementation is very hard; scarce resources (money and time of top management) will be used up in doing extraneous things which comes at the cost of those resources being applied to the core business of government, i.e. addressing market failures. If a government insisted on running Hindustan Machine Tools, to make wrist watches, the outcomes are not horrible on a large scale. The outcomes go wrong at a narrow scale. When I look back at this episode, the original sin was barriers to foreign providers. If only HMT had been forced to compete with foreigners making wrist watches, it would have rapidly died, and the problem would have gone away. The twin evils of autarky + public sector production gave a shortage of good quality wrist watches in the country. In the olden days, many countries tried to have State-run airlines or export-import banks, but such heterodox thinking hasn't stood the test of time. `Industrial policy' was once accepted as the job of government, but today it's generally seen as feeble thinking. All the above arguments apply in the field of finance. The job of the government is to address market failures. Attempts at doing things that go beyond addressing market failures are a bad idea for the same four reasons as those described above. But diverging from the orthodoxy is more damaging in finance than it is in non-financial areas. The public administration problem. When a government tries to shape the outcome of a financial market, problems of malfeasance are amplified as politicians and officials will also do insider trading. It is hard to create clean administrative structures for a public agency that's trading on markets or (in any way) trying to manage the market price. As an example, the clean UK solution is that the Monetary Policy Committee votes on everything that the Bank of England does : on the short term money market, the Bank of England will do infinitely large trades to control the short term interest rate, and that target rate is voted on by the MPC, and when the zero interest rate lower bound was reached, the MPC votes on the magnitude of quantitative easing that is to be done in each month. EMs and developing countries have experienced all kinds of problems when trading rooms in the government have tried to do trading in financial markets without sound institutional arrangements. These problems never arose when the government tried to meddle in the market for wrist watches. The Lucas critique. The next hurdle to cross is the Lucas critique. All participants in the market are rational and react to the actions of the government. A government says that stock prices won't be allowed to go down? This changes the behaviour of investors who think it's a one way bet and pile on massively. When INR was a "managed appreciation" with small predictable appreciations week after week, this kicked off a surge of capital coming into the country. Risk taking is higher when there is "the Greenspan put". A government says that exchange rate volatility will be kept down? This changes the behaviour of private participants who feel safe and don't hedge currency exposure. News breaks; INR should have depreciated; government props it up; capital flight by locals and non-residents benefits from a red carpet in the form of a more attractive exchange rate. The essence of financial markets is risk taking. Everyone in the market should have a keen sense that there is no free lunch. Long term investors should be those who are comfortable dealing with ups and downs. Speculators should know that skill in forecasting will make giant profits, but there is no safety net when they make mistakes. It takes years to create credibility in the eyes of market participants (a) That the government will keep out and (b) That the market will work properly. Each time these promises are violated, trust is lost and we start all over again. E.g. Dr. Subbarao did a great job of getting people used to the idea that the rupee is a market and that the RBI does not have an exchange rate target. We didn't think of Uncle Subbarao when we thought about the exchange rate. RBI is now back in action doing currency policy. Now all kinds of private players are back to their old ways: trying to hack into the government processes through which exchange rate targets are determined on a day to day basis, trying to make profits from the daily market activities, leaving currency exposure unhedged, etc. As the Indian government rediscovered in 2013, and as the Chinese government is rediscovering today, government management of financial market outcomes will always fail. These episodes generate a big mess for the economy. They give the government a bloodied nose. In the case of the equity market, in the 1990s, when there were sharp declines in the stock price, government would try to get involved by encouraging LIC and UTI to buy shares. Market development took place, the market got more liquid, and these levers became increasingly feeble. To the credit of the government, the understanding took root that MOF or SEBI are not responsible for the level of stock prices or stock price volatility. MOF and SEBI are responsible for addressing market failures, which in this case means micro-prudential regulation of clearinghouses and their members, and enforcement against market manipulation. This new environment has been in place for a long time and the expectations of market participants have been largely reshaped. Nobody in India thinks that an Uncle Xi will determine the stock price. In terms of scandals, we had the last big scandal in 2000, which is now 15 years ago. With 15 years of boring functioning, market participants are increasingly gaining trust that the equity market just works. When end-users and financial firms are steeped in this environment, organisational capital starts developing in financial intermediaries, which is what gives depth of market efficiency and market liquidity. That process has been in place for 15 years in India. In China's case, they would start from scratch in (say) 2016 after the present mess is sorted out. In India's case, comparable intellectual quality was not found on the Bond-Currency-Derivatives Nexus and we are still in the dark ages. What is the cost of one-rank-one-pension?